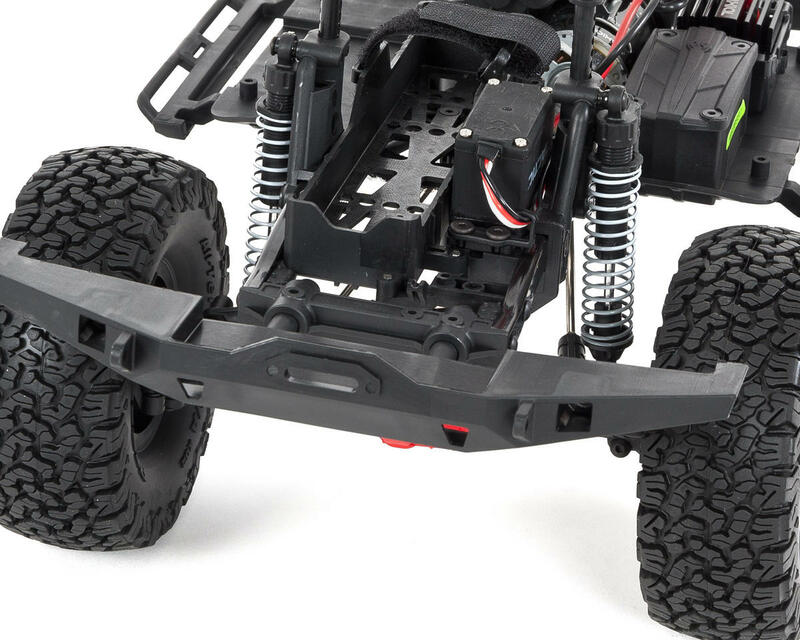 The next generation of RTR SCX10 is here! 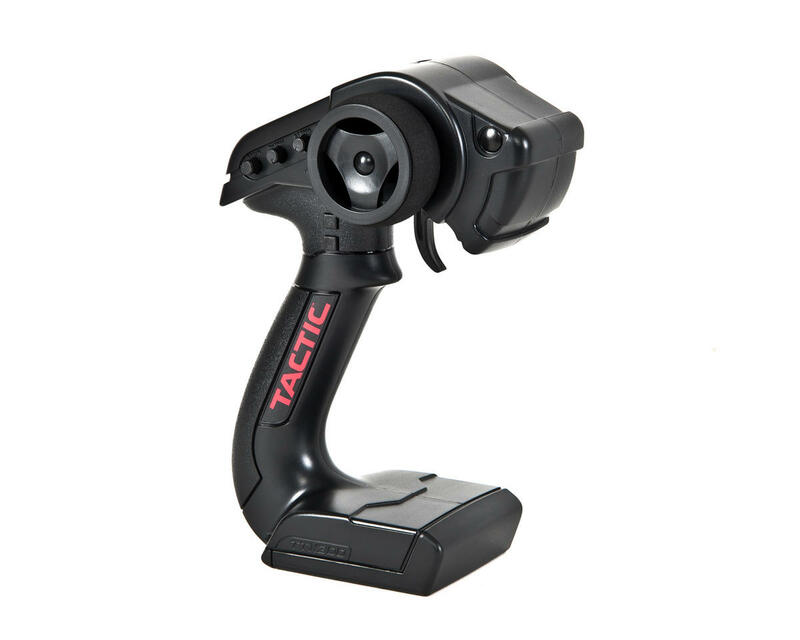 TACTIC TTX300 3-CHANNEL SLT RADIO: Sport-level racers and bashers will appreciate the Tactic TTX300's many popular features, along with its amazing adjustability. It features a programmable 3rd channel making for incredible versatility; it can operate functions such as two-speed shifting, winches and lights, making it ideal for a vast array of opportunities. Need more reasons? There's SLT (Secure Link Technology), which creates an unbreakable link between the receiver and your transmitter with push-button ease. TACTIC 3-CHANNEL 2.4GHz RECEIVER: The Tactic TR325 2.4GHz receiver uses no crystals and features an internal antenna, so you'll experience worry free driving without frequency conflicts or antenna damage. This lightweight, compact, and bind button equipped receiver with LED indicator makes setup easy! 35T BRUSHED MOTOR, WATER RESISTANT: Providing an even balance of speed and crawling, the 35-turn brushed motor features a worry-free design with an integrated cooling fan allowing for extended periods of use. Easy operation: no tuning, no fuel, and no loud exhaust noise. Just plug 'n' go! ALL STEEL SUSPENSION LINKS: Strong steel links for both suspension and steering. Large M4 rod ends for durability. 1.9 METHOD MESH WHEELS: In an industry that's all about the latest and greatest, while taking advantage of styling trends, sometimes the 'less is more' approach is quite refreshing and the mesh wheel offers just that. Clean, simple and METHOD STRONG! These officially licensed METHOD Mesh Wheels are replicated in true form for durability and a clean line look. STEEL C-CHANNEL FRAME RAIL CHASSIS: The realistic high strength c-channel chassis frame is made of durable steel with cross bracing for reinforcement and is held together with all hex hardware. 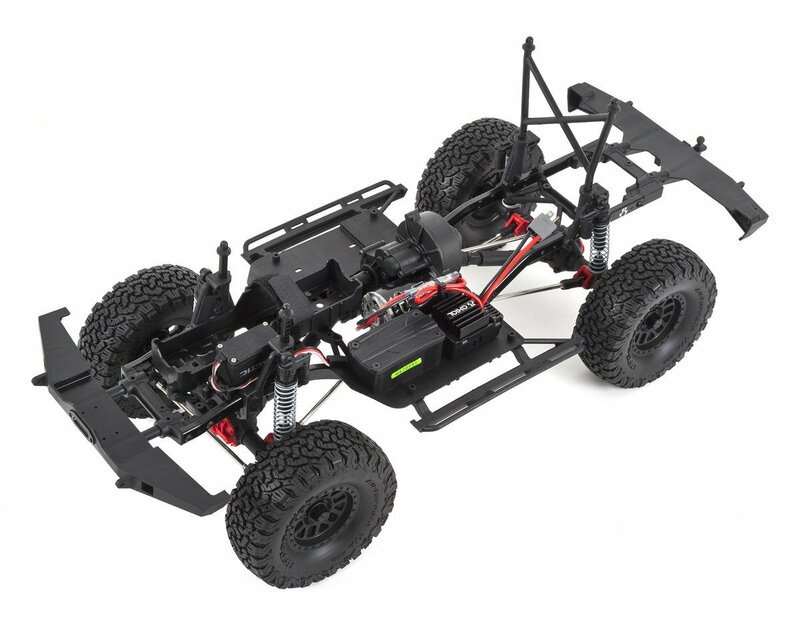 Realistic looking frame and cross braces improve chassis rigidity (torsional stiffness). Realistic shock hoops with multiple shock mounting positions allows you to adjust your suspension for maximum performance. The simplified design makes maintenance and assembly quick and easy. 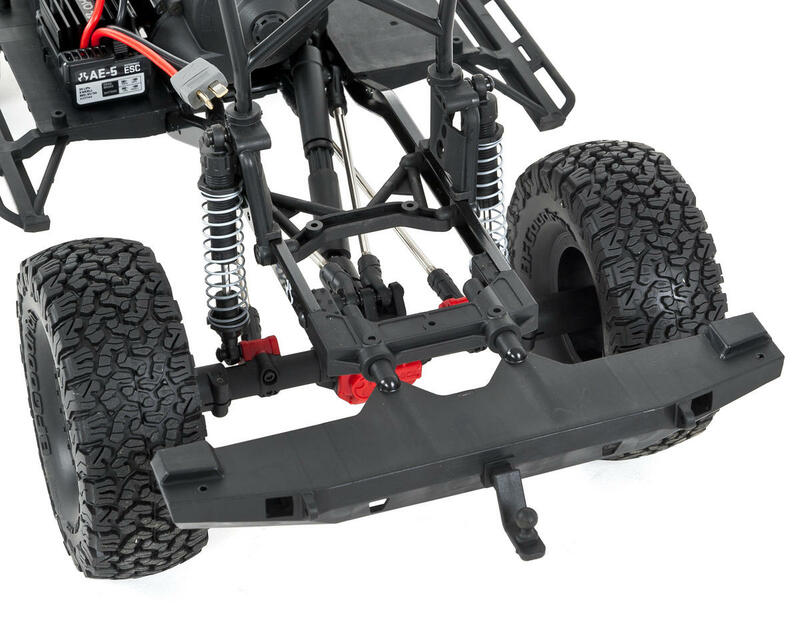 The contoured skid plate significantly reduces hang-ups on terrain. Compared to the previous design, additional holes have been added to the rear portion of the frame rails for making wheelbase adjustments. 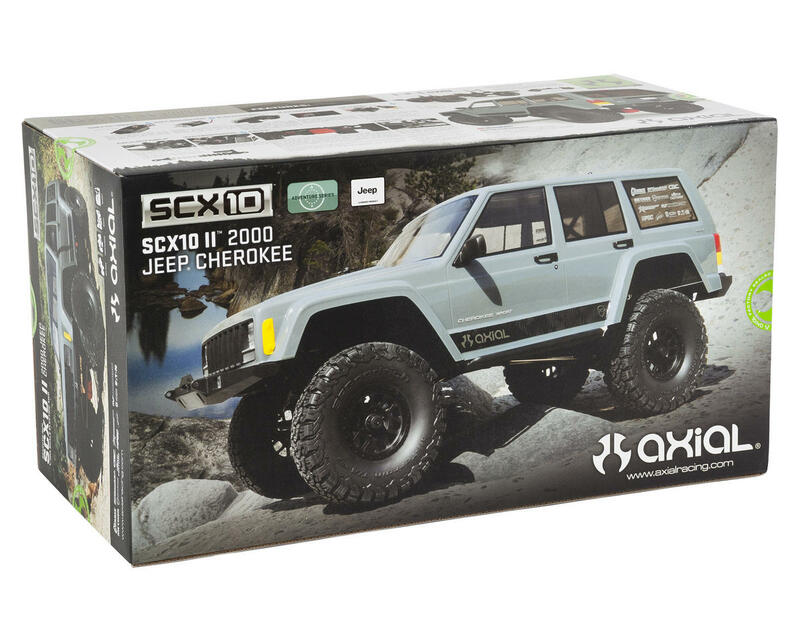 2000 JEEP® CHEROKEE BODY: Pre-painted body with molded scale detail parts (Grill with clear lenses, mirrors, door handles and liftgate trim panel). RECEIVER BOX, WATERPROOF: Three different silicone seals are included, one for the antenna, one for the servo wires (includes three slots for three channels), and one that acts as a gasket for the receiver box cover. No more stress when running in mud, water, or snow! 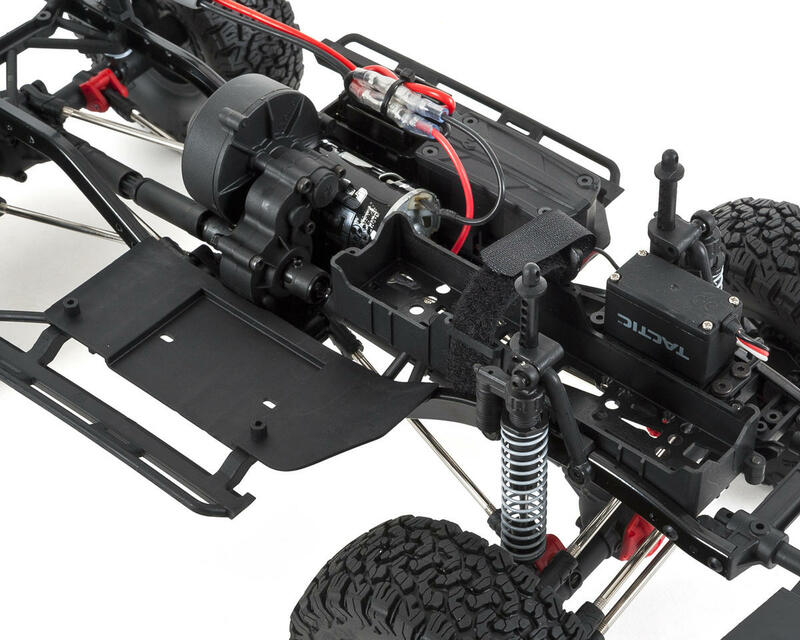 WIRE ROUTING: Wire routing has been thoroughly thought through to help keep your chassis layout looking clean. In addition to including wire clips/guides, there has been a channel created that runs the length of the chassis so you can run additional wires hidden inside the c-channel frame. I went in with my son 1/21 and bought mines, love it, runs good and holds it's own very well. Can't wait to do upgrades. Fantastic crawler out of the box, quiet as a mouse, radio only takes 4 x AAs, and great scale look. After a few battery packs the shocks started to leak a bit, probably due to plastic shock body and cap. A simple upgrade on the shocks will remedy this. New design climbs over just about everything but you might need to upgrade bumpers if you want it to be extra nimble on rocks as they stick out a bit and tow hitch grabs on most things but looks great in photos. Stock motor is great and esc is good but would be useful with on/off switch for practicality. Overall a great truck, upgrades a plenty as most scx10 parts fit. well done axial racing. 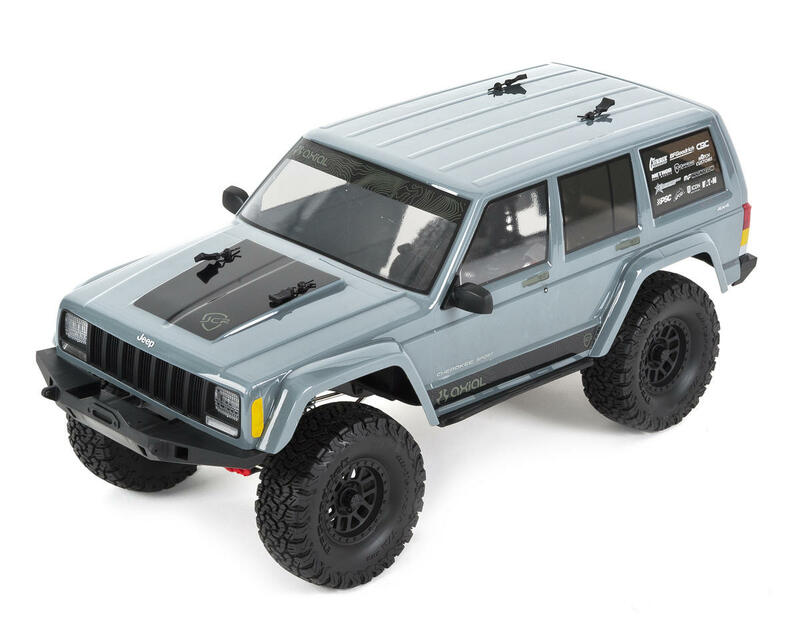 I bought my 2000 SCX10.2 2000 Jeep Cherokee RTR in April 2018 and loved it right away. I have had it for over 2 months and nothing has broke or leaked. Only problem I have is with the stock bumpers being so bulky. I recently replaced the front with a SSD D110 winch bumper with RC4WD Warn 9.5cti winch. I absolutely love the Cherokee. OK VERY FLEXIBLE PLASTIC EVERYWHERE! Bad plastic leaky shocks, very bad axle alignment out of the box, Whole truck leans to the drivers side and adding compression will limit travel making the chassis balanced is the only fix, rear end so light ya might as well make it front wheel drive(battery ALL the way up front bad idea! ), has a great motor/esc/gearing combo and cheap plastic wheel/tire combo though. 200 bucks in aluminum, much time re-aligning suspension linkage, new shocks(kings rc4wd's), adding weight in the right places, and wondering why I didn't build the damn kit. 3 of 13 customers found this review helpful.